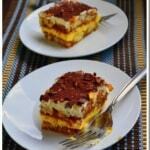 Tiramisu – though Italian by origin has won the hearts of people all over the world. I am sure there are very people on this earth who don’t swear by this dessert. My only regret is that I did not make this sooner or even think of making it. I was under the impression that it needs a lot of ingredients and skill that I believed I seriously lacked. 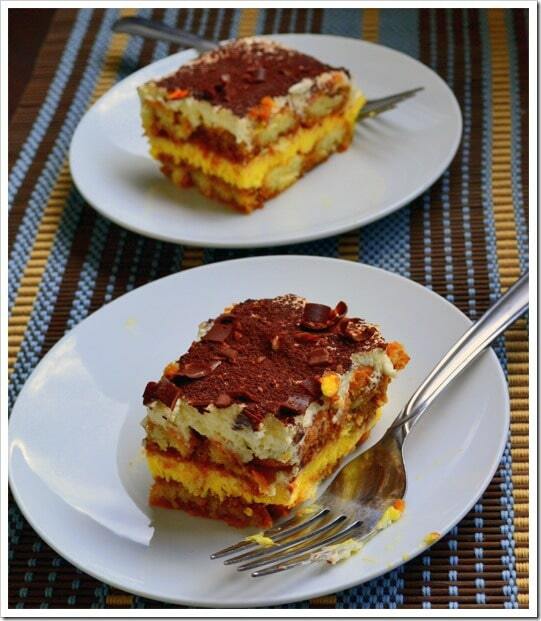 But that is so far from the truth – you can make Tiramisu even if you haven’t made any kind of cake before. You can’t go wrong with this recipe! I read through a lot of recipes before I settled for this Tiramisu recipe to get started. I was a little nervous and skeptical because I modified the recipe a little and was not sure how my Tiramisu would turn out. The occasion seemed perfect though – T’s birthday was round the corner and also I was hosting my friends who were kind enough to volunteer as guinea pigs . What more motivation could I ever need? So what’s great about this recipe – Easy to make (check), Crowd pleaser (check), Makes people (read husband) take you seriously as a cook (BIG SMILE followed by a happy dance and a BIG check). Also, I would like to highlight another version of this Tiramisu recipe that I might try one day, which involves the preparation of the cream with eggs heated to sterilize it. But for now, this will more than do. Note: This recipe uses raw eggs. Please make sure to use fresh eggs! Add egg yolks and sugar to the mixing bowl. Beat the egg yolks with 4 tablespoons of sugar on medium speed till you get a creamy light yellow mixture. Add mascarpone cheese and continue to mix till it is well blended. This is filling #2. Dip the ladyfingers in the coffee and lay them in a 7 by 11 Pyrex tray one by one till the bottom is completely covered. (Note: Dip one ladyfinger at a time - do not soak them). Spread filling #2 (egg yolk - mascarpone cheese mixture) over the ladyfingers gently using a spatula till the ladyfingers are evenly covered. Follow it by a layer of coffee-dipped ladyfingers. Spread filling #1 (egg white and whipped cream mixture) over the ladyfingers gently and evenly using a spatula. Sprinkle cocoa powder over the cake evenly and garnish with shaved chocolate. Cover the tray and refrigerate the Tiramisu for 4-6 hours, until set.